A deposit of 50% of the total price is due at the time of booking. Checks should be made out to James Brown/Norman White and mailed to us at: 236 Park St., Bennington, VT 05201. 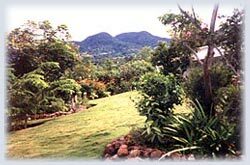 Upon receipt of your check, you will receive written confirmation on your reservation, a grocery list, Holiday Montserrat Magazine, and a Montserrat Road Map & Guide. The Neville Bradshaw Agency will contact you about car rental information and taxi service. This is due 30 days before departure. For bookings made in less than 30 days previous to departure, full payment is due at the time of booking. All monies paid are subject to forfeit dependent upon villa being re-rented for the period as the cancelled rental. If the villa is re-rented, then a full refund will be made, less a $100.00 cancellation charge and the cost of foreign exchange.